Magoo alerts us to this wonderful post by Tony Thomas at Quadrant Online. I elevate his comment to increase its visibility immediately and I hope to have time for further comment soon. 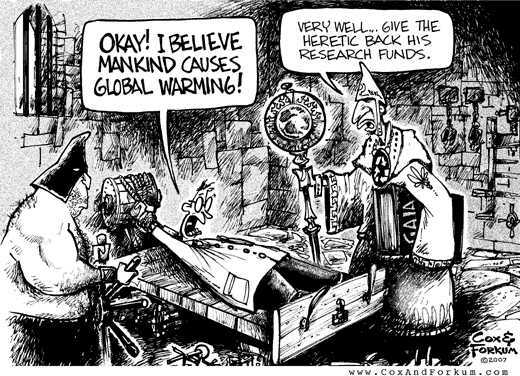 Figuratively, of course, not literally, but this is what happens to scientists being employed in today’s climate (pun perhaps intended). Here’s a stern test of the neutrality of any science organisation, such as NIWA: does any scientist who doesn’t believe in man-made global warming work for them? If such “denialist” scientists are employed by a public science body in New Zealand, let us meet them to discuss the difficulties they face! Anthony Watts announces what he calls “an important moment in science history.” Professor Harold Lewis reluctantly discards his 67-year membership of the American Physical Society in protest at the global-warming-driven corruption of science (h/t val majkus).